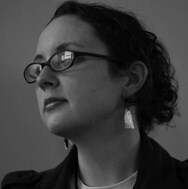 Emilia Phillips is the Associate Editor of Blackbird. Her poetry has recently appeared in 42opus, Adirondack Review, Asheville Poetry Review, Conte, and elsewhere. In July 2009, she was named Cutthroats Discovery Poet, and her chapbook, Strange Meeting, was released in April 2010 by Eureka Press. Phillips is from Chattanooga, Tennessee, but now lives in Richmond, Virginia where she's an MFA candidate at Virginia Commonwealth University. Photograph by Patrick Scott Vickers, 2010.
notes as they marble across the cement floor. as sitting in a just-vacated seat. one whole. The others, merely motor. close gently like a blind eye's lid. Rose…“Where are you, my chickadees? One with his cap low on his brow. The younger, Charles with thin face. Of desire, no pillows stuffed with down.